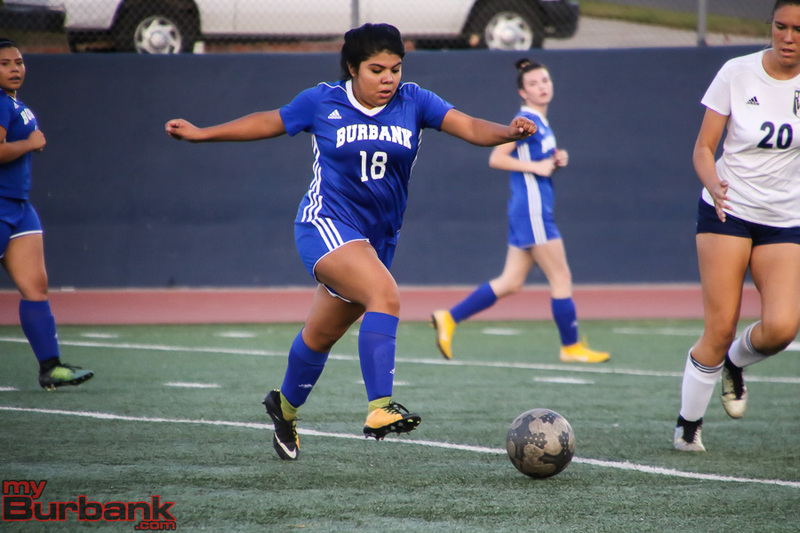 Burbank High girls’ soccer coach Pablo Diaz had accepted the fact that he doesn’t have the same talent that Burroughs High has this year. So Diaz knew he would have to come up with something different in hopes of pulling off an upset. 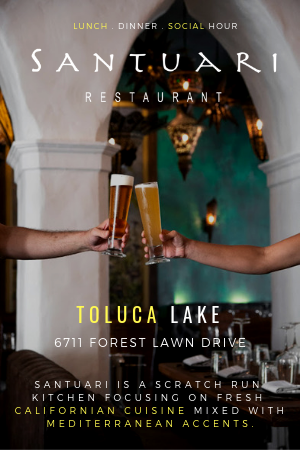 The idea was certainly a clever one. 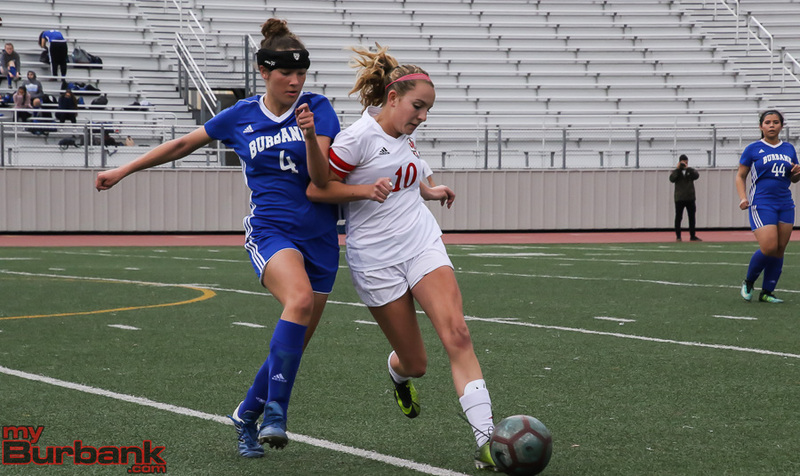 But Burroughs High found a way to break up Burbank’s tactical scheme as it earned a 7-0 road victory Friday. 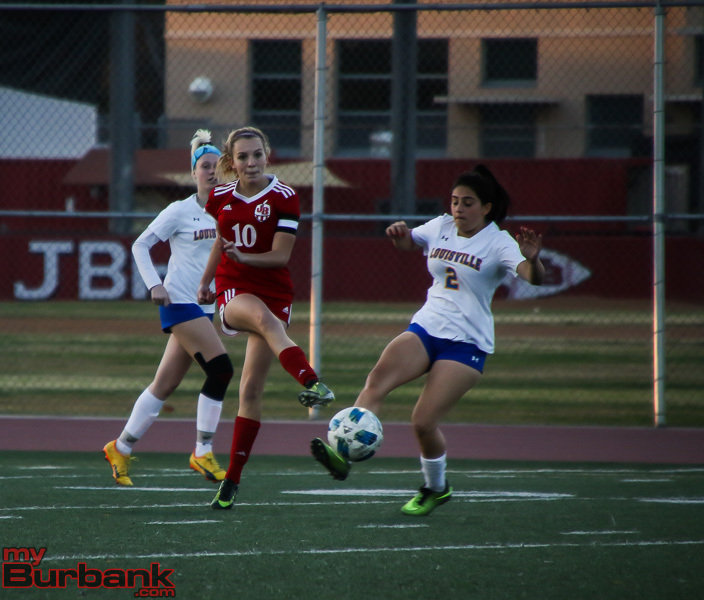 Burroughs (10-3-2 overall, 5-1-1 in league) got first-half goals from Lauryn Bailey, Olivia Cashman, Samantha Valencia and Abbie Riggs. Burroughs coach Brady Riggs praised Diaz for continuing to make his team come ready to play. “I really respect Pablo. 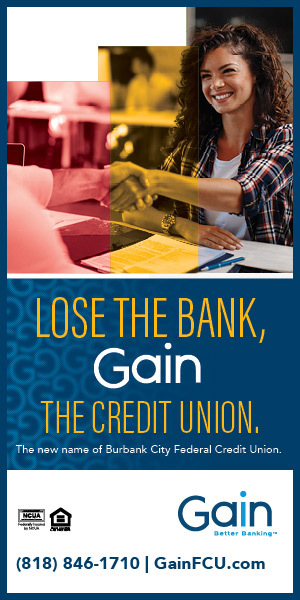 I know what he’s trying to do here and I can see he’s got them going on the right track. 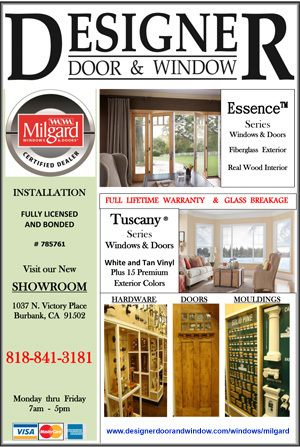 That’s exciting for them,” Riggs said. 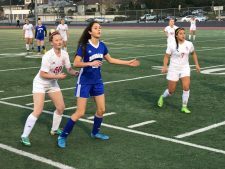 Riggs is hoping his team can bounce back after a league loss to Arcadia in the second half of league play. “We can win league if we win out and that’s what we’re trying to do for the first time in 25 years,” he said. 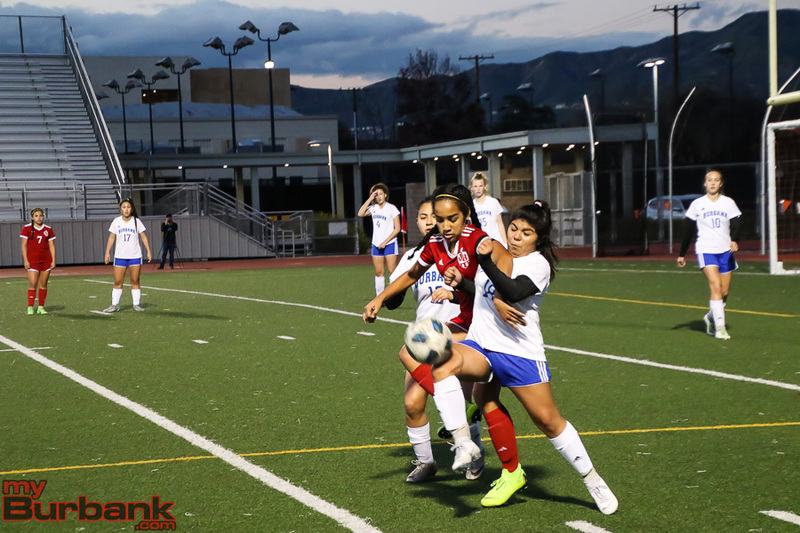 Burbank (3-10 overall, 3-5 in league) had a few opportunities to score, but were able to get to the back of the net. 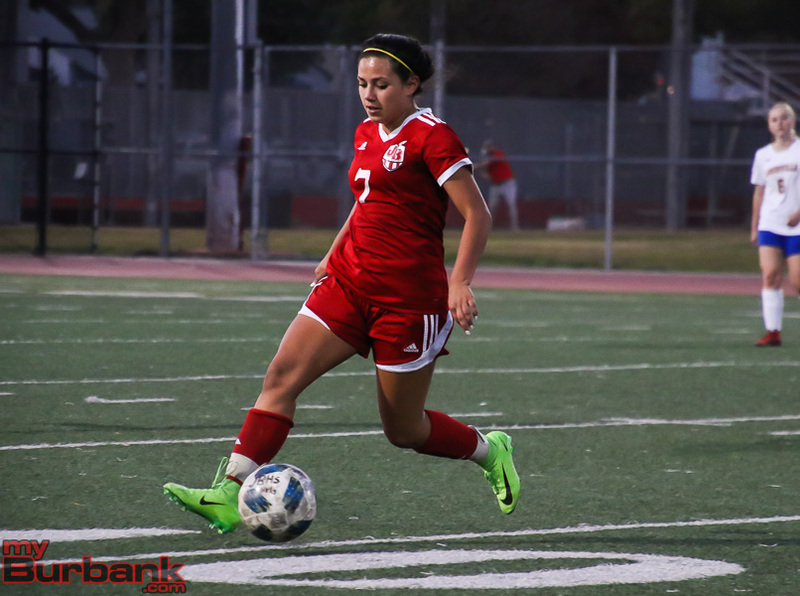 Liliana Partida took a shot off a corner kick in the 44th minute that went over the bar. 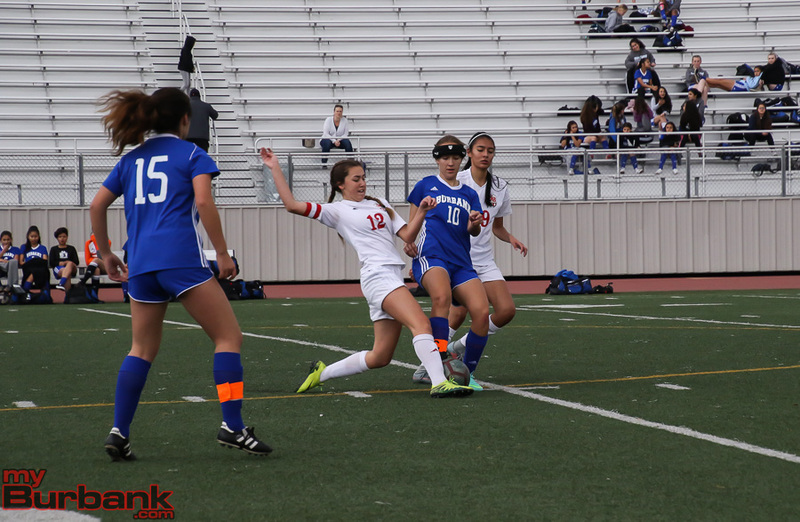 Isabel Partida also added a shot in the 52nd minute. 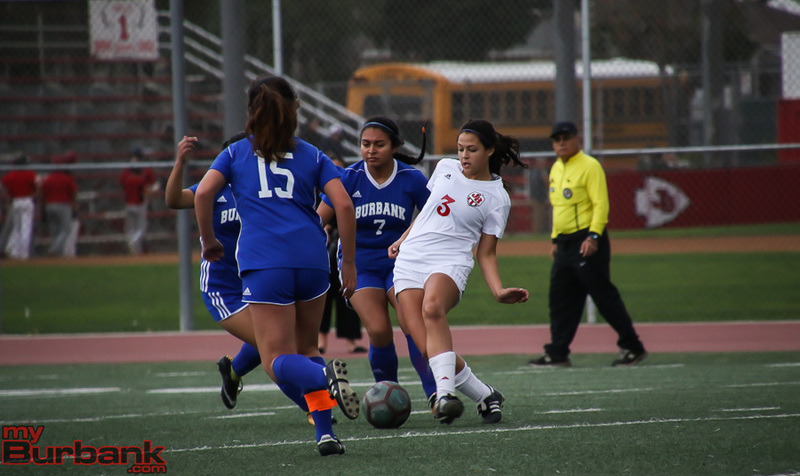 Burroughs Lily Gonzalez added two second-half goals to increase her team’s lead to 6-0. 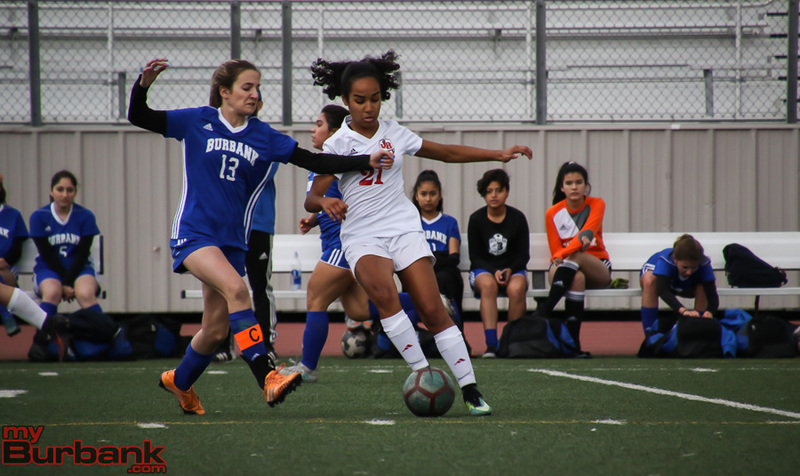 This entry was posted in Girls Soccer, Sports and tagged Abbie Riggs, Burbank girls soccer, Burroughs girls soccer, Isabel Partida, Lauryn Bailey, Liliana Partida, Lily Gonzalez, Olivia Cashman on January 11, 2019 by Jim Riggio. 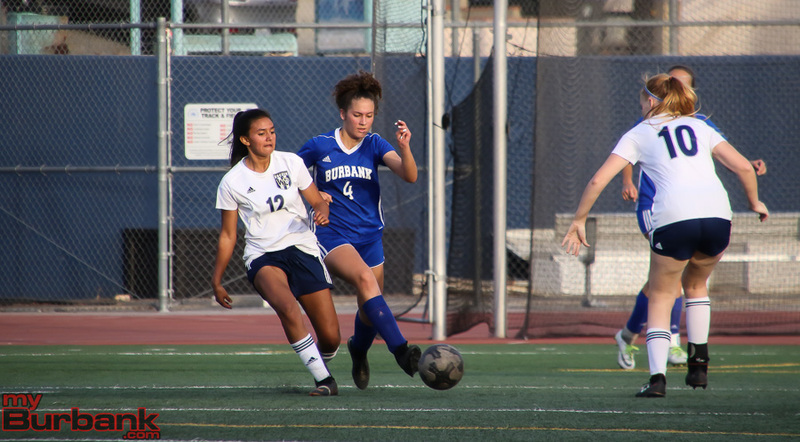 Burbank High star senior Kira Bochard knows that now that the CIF Southern Section playoffs have begun every game could be the last one of her career. 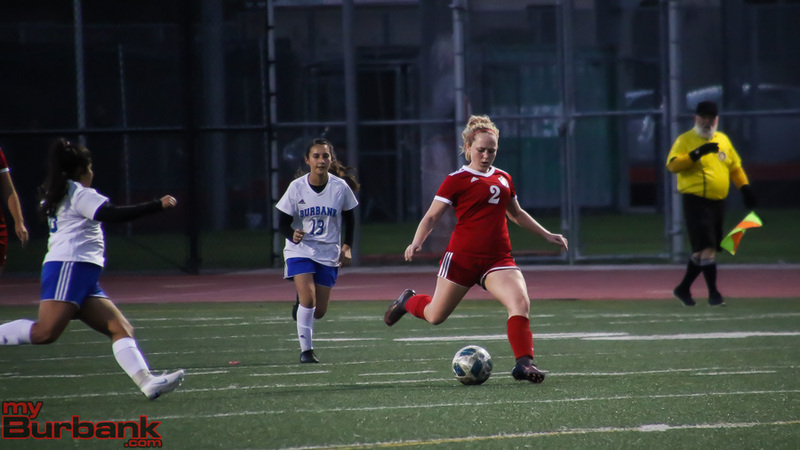 Tuesday afternoon Bochard came up huge for the Bulldogs in a number of ways as the Bulldogs outlasted Mayfield of Pasadena 3-1 on penalty kicks in a Division 4 wild card match at Occidental College in Eagle Rock. 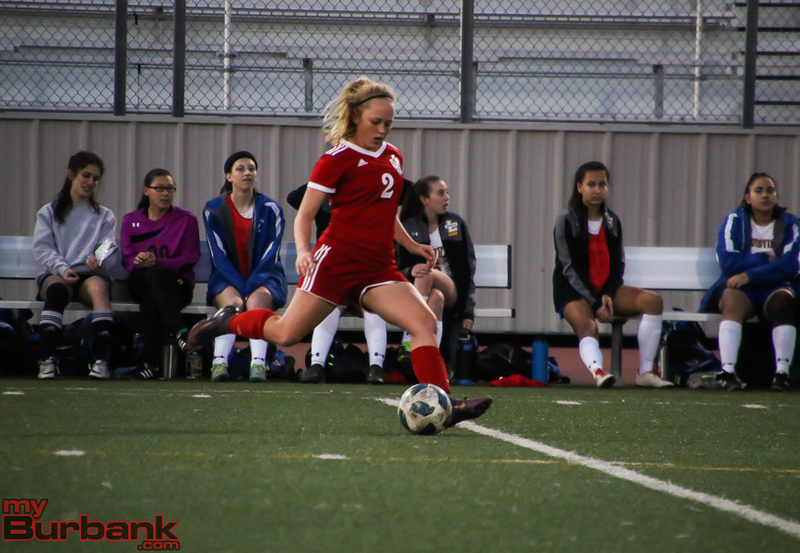 The match ended in a 2-2 tie after regulation and two 10-minute overtime periods. 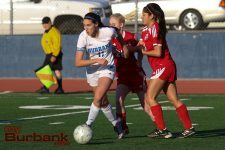 “I’m going to do everything that I can to win for my team,’’ said Bochard, who has committed to play soccer and run track at the University of Montevallo in Alabama. That included putting on the goalie gloves for the first time ever at the high school level to help save two penalty kicks in the shootout. 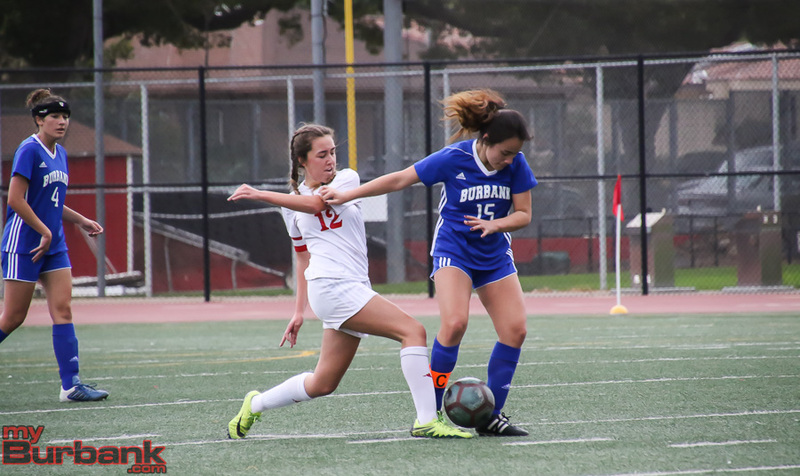 Bochard scored Burbank’s final penalty kick in the shootout by putting the ball in the lower right corner past Mayfield goalie Isabella Taglioretti. 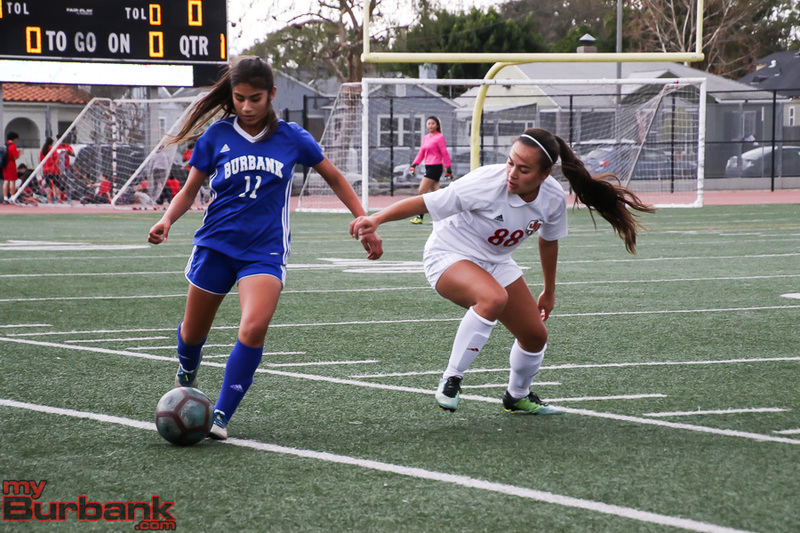 Burbank’s two other penalty kick goals were scored by Cynthia De La Cruz and Priscilla Romero, who both ironically also kicked the ball low into the right corner. 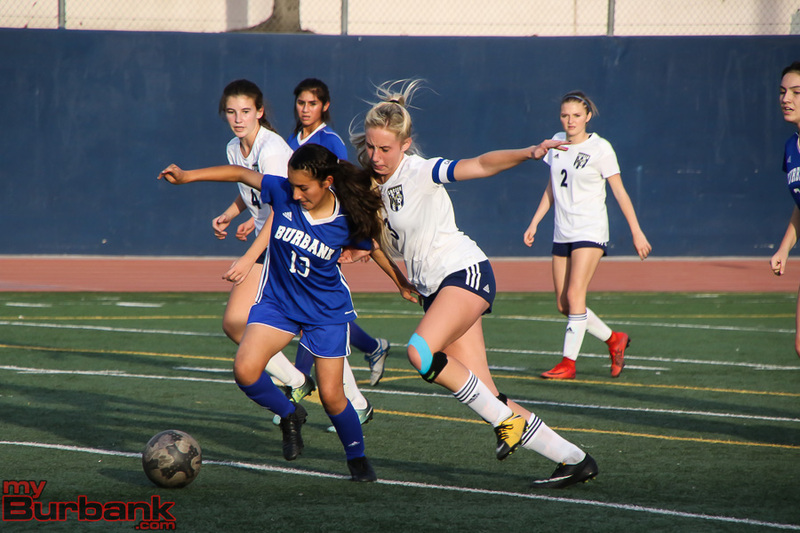 Bochard saved penalties from Mayfield’s Nadia O’Reilly and Michaela Gallo. 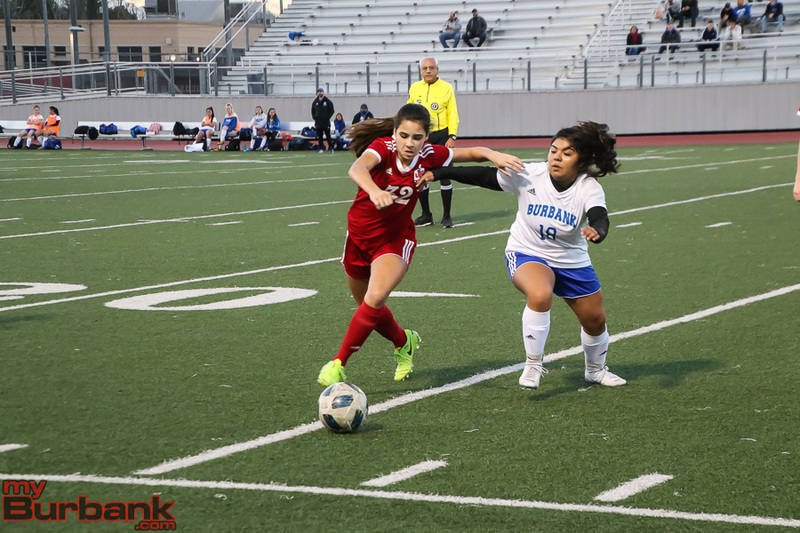 Burbank (6-9-4) will now face host Brentwood (13-3-1) in a first-round match Thursday. 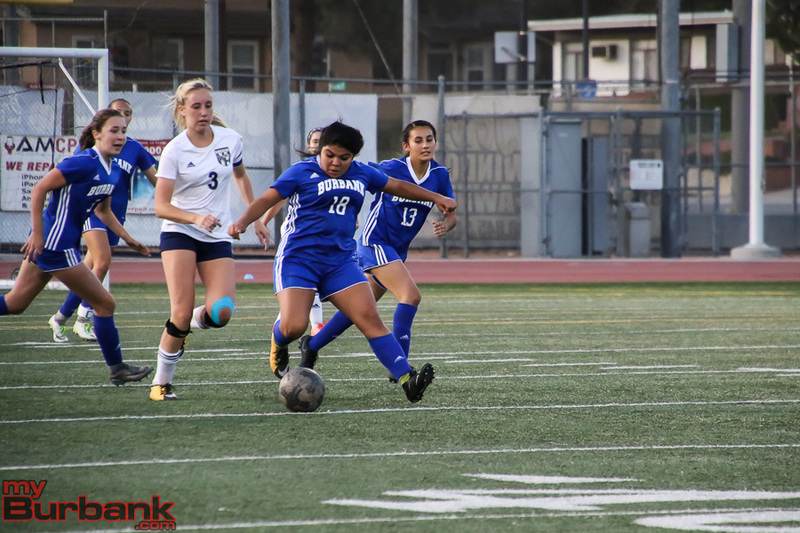 Bochard scored a goal in the first half from a corner kick to give Burbank a 1-0 lead. 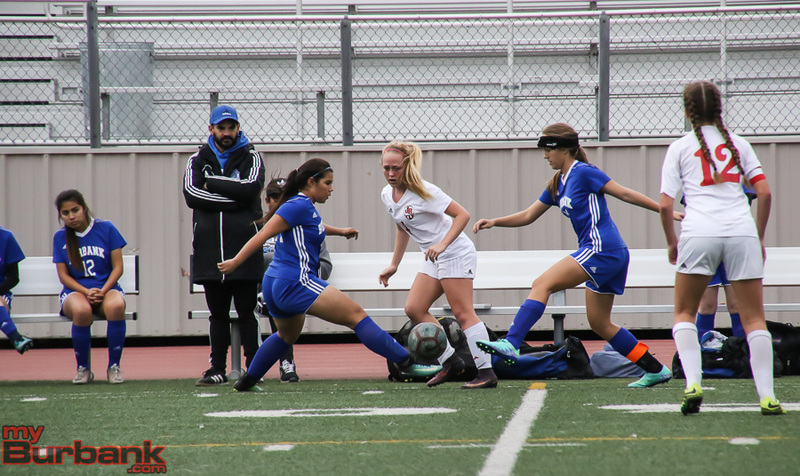 Mayfield (8-6-6) came back to score twice and take a 2-1 lead before a Danielle Yanez throw in found Isabella Palau at the back post, where her right-footed shot was able to tie match with 13 minutes to play. 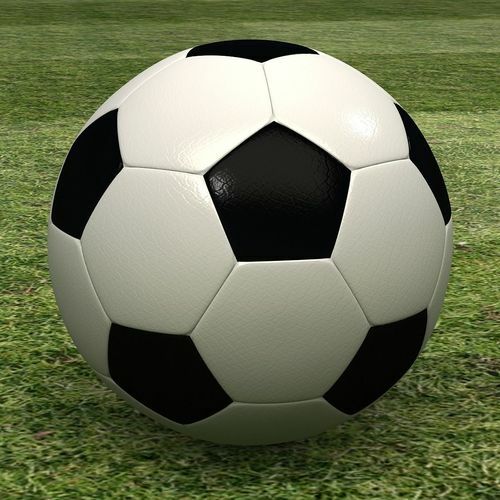 “The momentum was great to get that second goal and get us back in it,” Palau said. The win gives coach Eric Montoya a playoff victory for a second consecutive year. 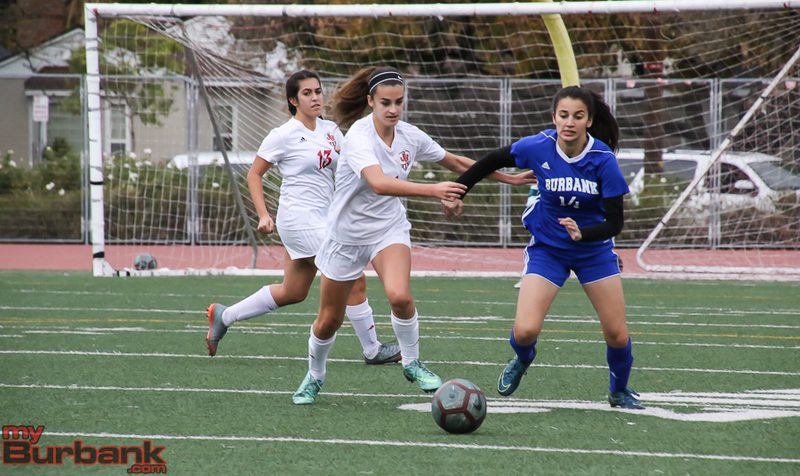 This entry was posted in Girls Soccer, Sports and tagged Burbank girls soccer, Cynthia De La Cruz, Isabella Palau, Kira Bochard, Priscilla Romero on February 14, 2017 by Jim Riggio. 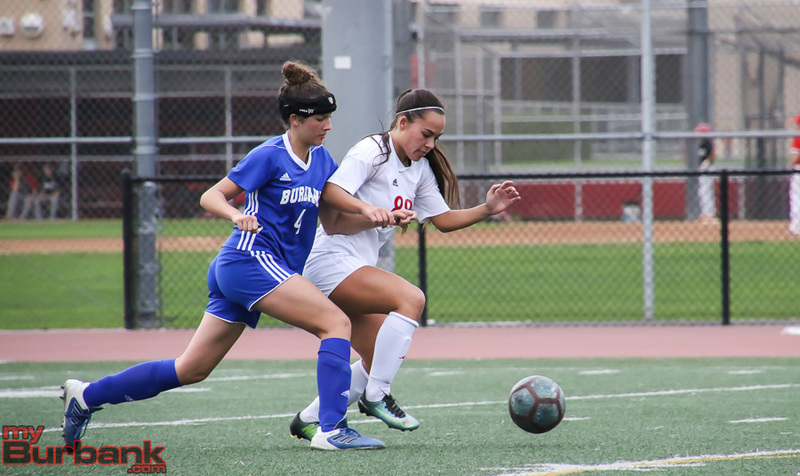 Establishing solid programs is what the Burroughs and Burbank High girls’ soccer teams have become. 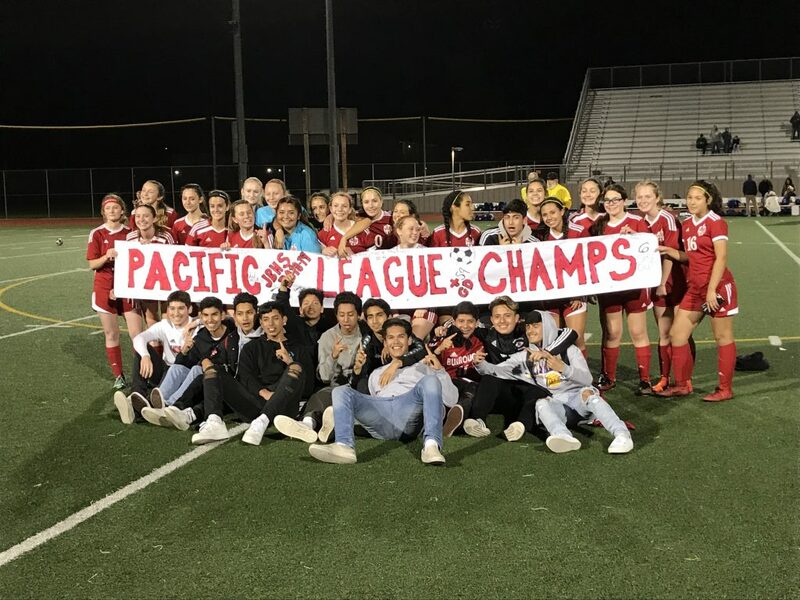 Both teams qualified for the CIF Southern Section playoffs a year ago and both are hoping to make a return to postseason play. 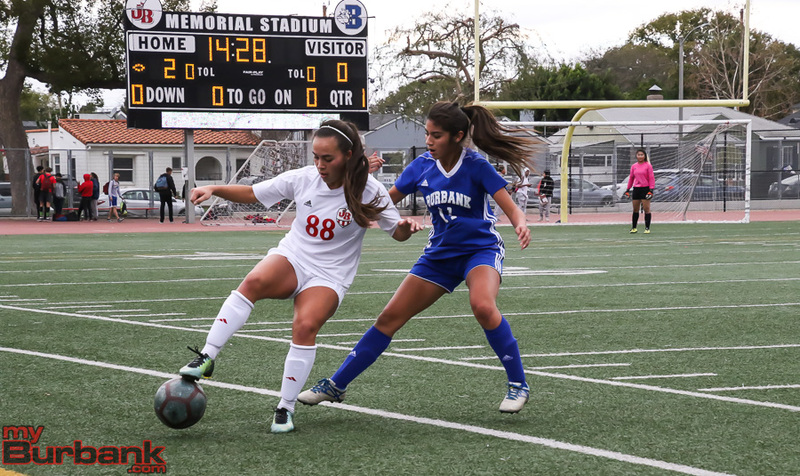 Burroughs returns a solid core from a team that went 12-5-1 overall and 9-4-1 in league last season. 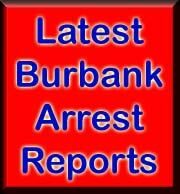 The Indians lost in the first round of the CIF Southern Section Division 4 playoffs. The Indians have begun this season with a 4-1-1 record, including a 2-0 league record. 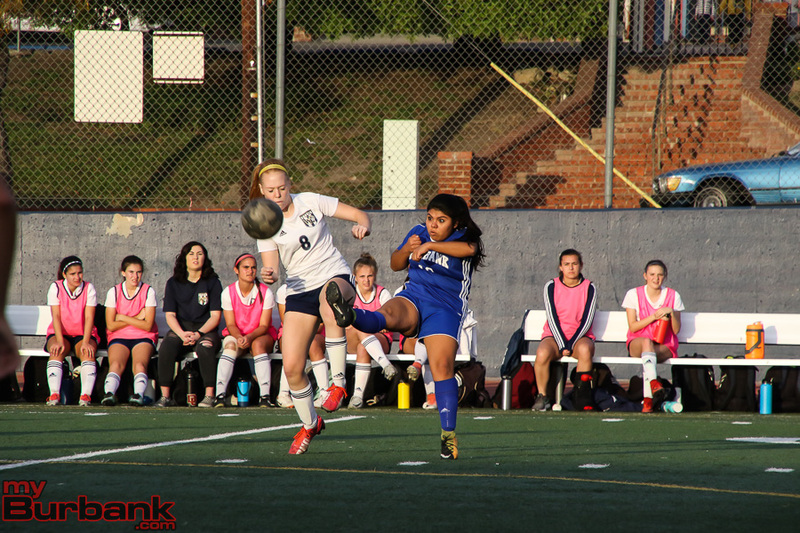 Senior center midfielder Mireya Gonzalez is a returning first-team all-league pick. 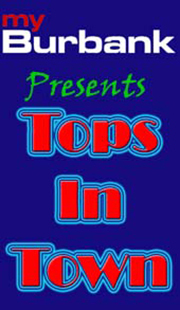 She will be looking to find striker Maddie Riggs up top. Riggs was a second-team all-league pick and has signed to play golf at UC Irvine. Joining Maddie Riggs in the attack will be sophomore Tatiana Mosdale and junior Catrina Villalpando. 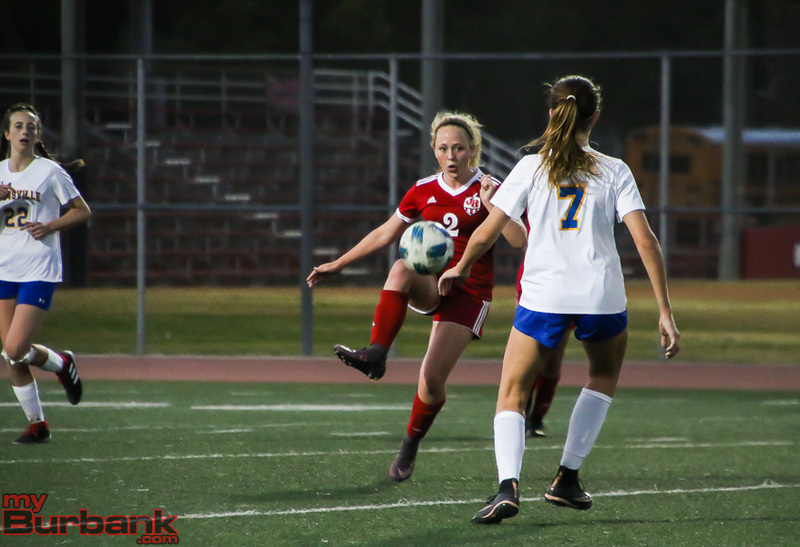 In goal, Burroughs has seniors Emily Orsatt and Emma Bartram vying for the starting spot. 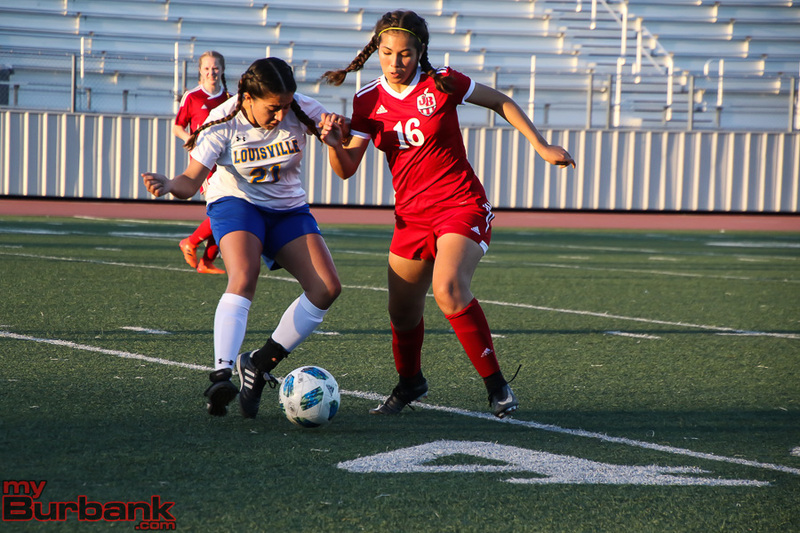 Senior Alondra Solis is expected to play a key role in the midfield alongside Gonzalez. Junior Maddy Sena is one of three team captains and will hold down a starting spot in the midfield. 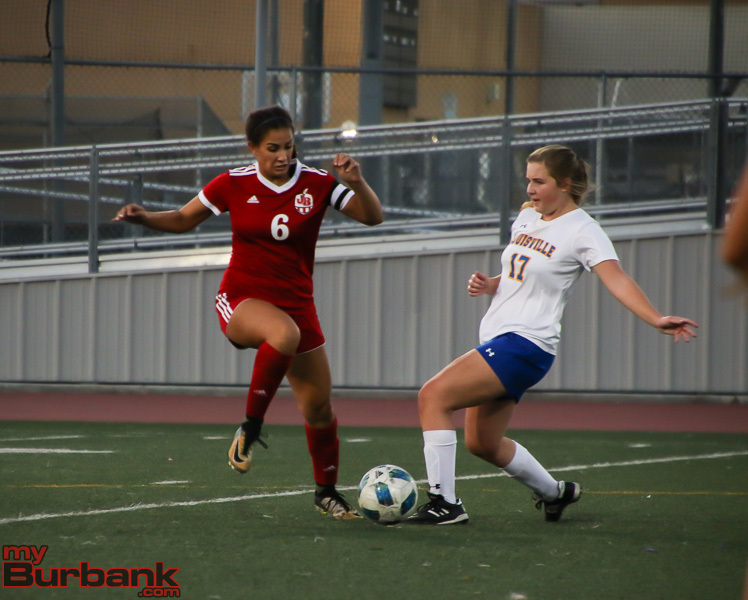 Senior Larissa Perez is a starting central defender and is joined in the middle by junior Carina Sierra. Junior Nathalie Celio and sophomore Emily McHorney are expected to hold down the defensive wing positions. Junior Anna Kasper also figures to hold down a starting spot. 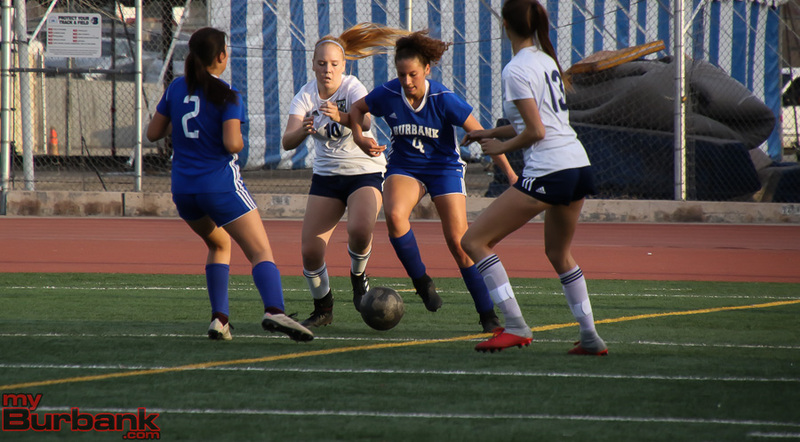 Senior Sarah Faucheux and sophomore Samantha Avendano provide depth on defense. 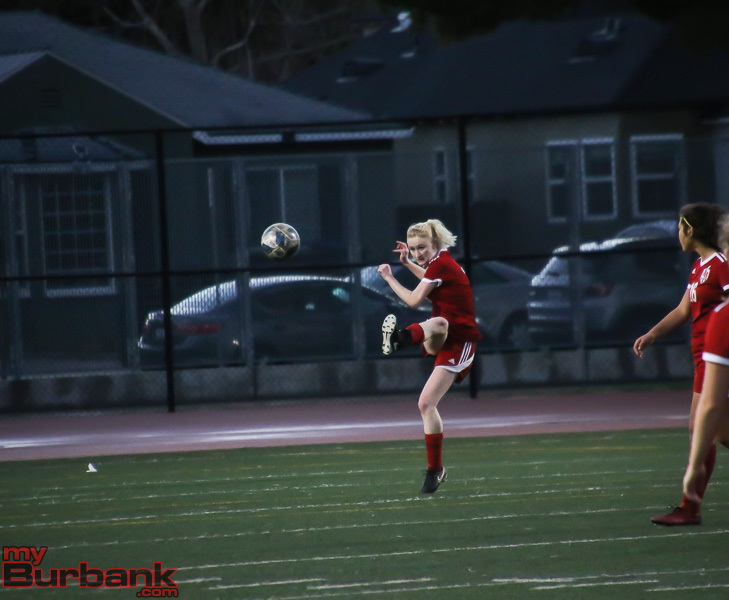 Sophomore Abbie Riggs provides depth to the midfield. 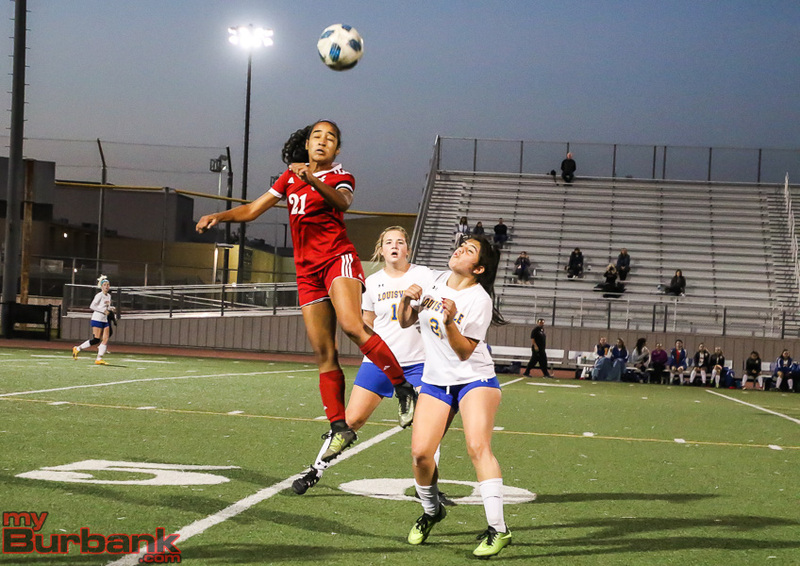 Makena Sierra and Callie Suppa were both out last season with injuries and will look to help fill in as needed. 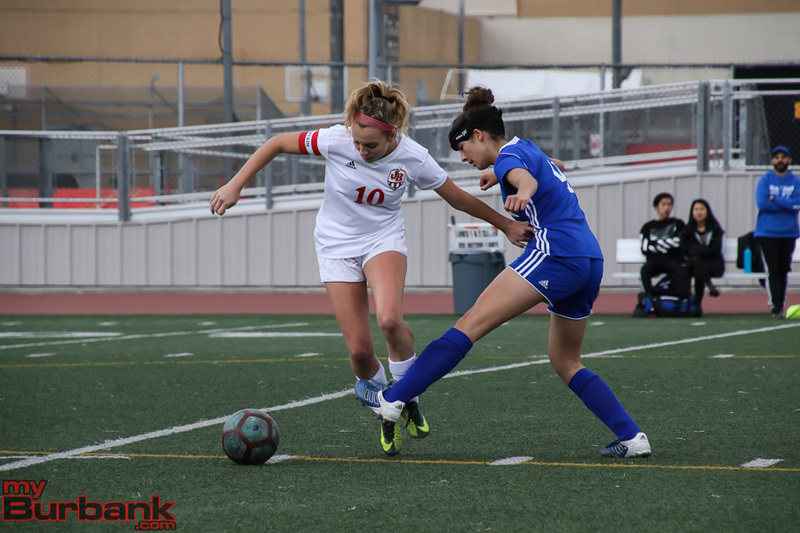 Senior Bella Nava is another option Burroughs has in the attack. 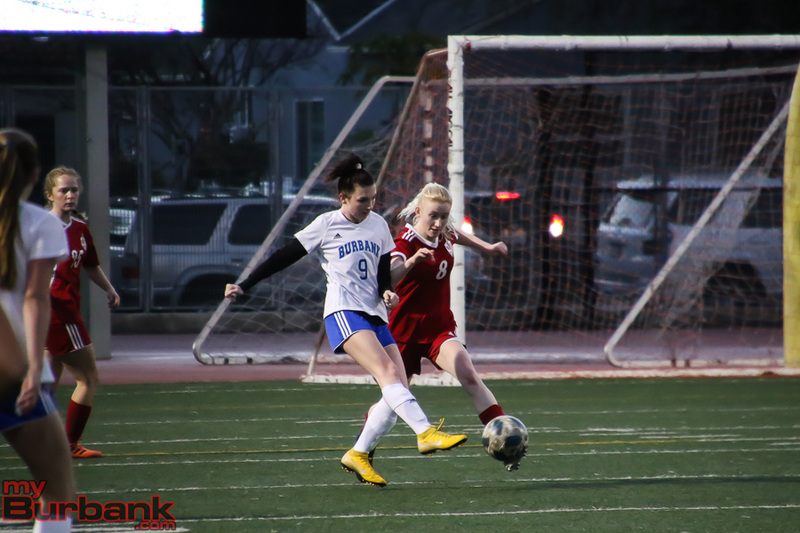 Burbank went 11-5-3 last year and 9-4-1 in league and went to the second round of the CIF Southern Section playoffs. 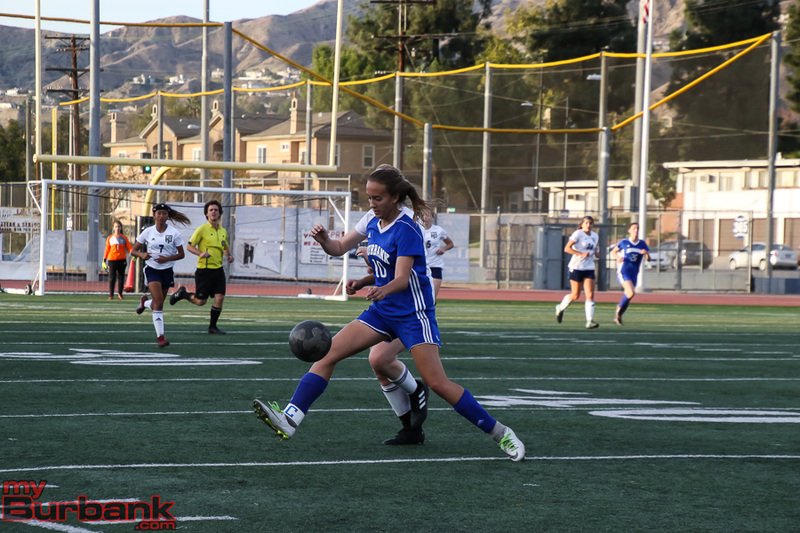 The Bulldogs have nine returning players and are led by senior and four-year varsity player Kira Bochard, who is coming off a successful cross country season. The Bulldogs have lost their first two league games this season, both without Bochard. Bochard is expected to re-join the team this week after finishing club soccer commitments. 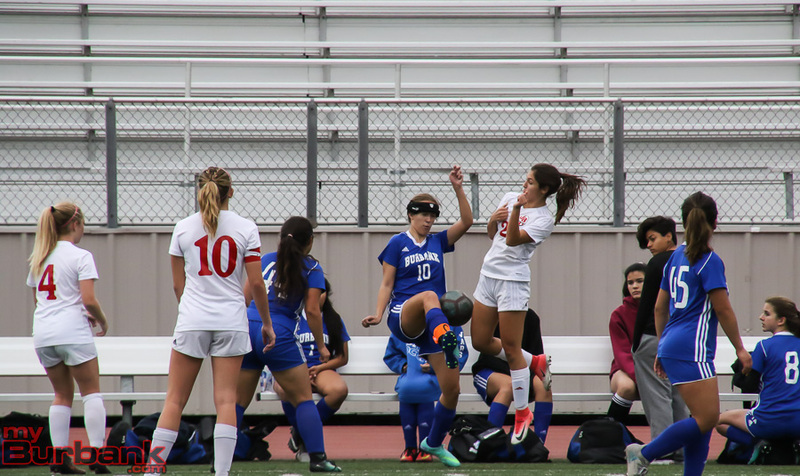 Also back are senior defender Melanie Tirado, utility player Cynthia De La Cruz, goalie Nicole Winters, midfielder Jamie Giammichele, midfielder Pricilla Romero, midfielder Julia Ordonez and defender Katie Trujillo. 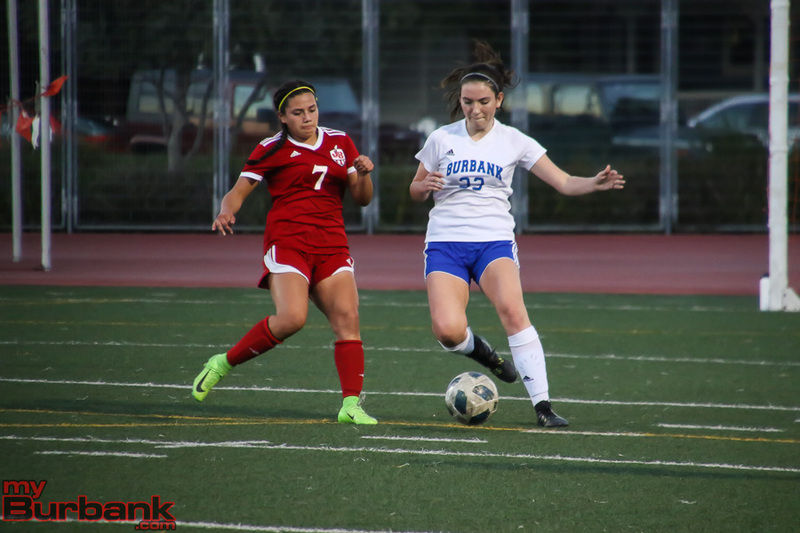 Also returning is junior midfielder Adrianne Sarukhanyan. 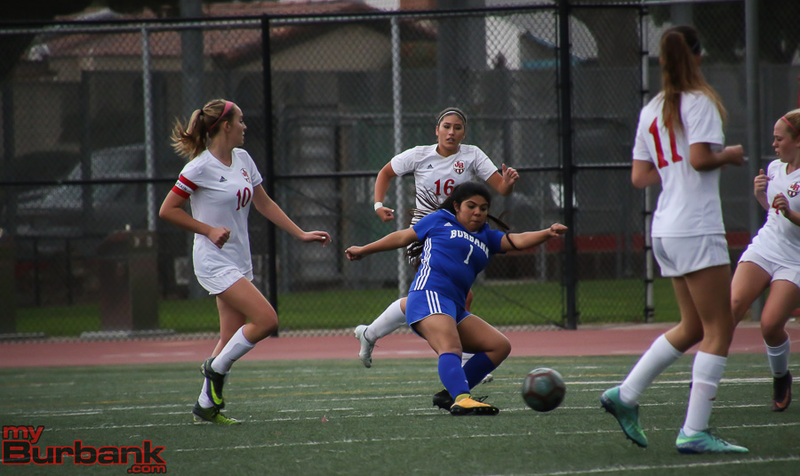 New to the squad are sophomore Maria Perez, senior Ileana Guerrero, sophomore Nicki Urrego, junior Amanda Kim, senior Isabella Palau, junior Alexia Muller, sophomore Kamille Eugenio, junior Ryan Verhoeven, sophomore Isabel Partida, senior Daniela Yanez, junior Victoria Mongiardo and sophomore Jessica Rocha. 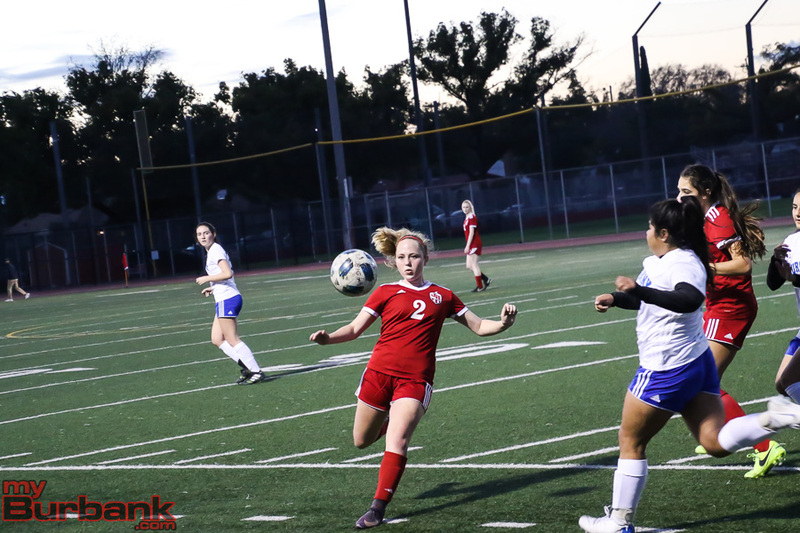 This entry was posted in Girls Soccer, Sports and tagged Burbank girls soccer, Burroughs girls soccer, Kira Bochard, Maddie Riggs, Melanie Tirado, Mireya Gonzalez on December 11, 2016 by Jim Riggio.